It's the biggest jigsaw puzzle you've ever seen but in this case, there are no instructions on the box. Hundreds of bones are laid out on the floor and Dr Hilary Ketchum, of the Oxford Museum of Natural History, has kindly offered to piece them all together. It takes more than an hour to slot the makeshift skeleton of Eve the plesiosaur into place. And you can clearly see the giant scale of the animal, with its large flippers and long neck. Plesiosaurs ruled the oceans for more than a hundred million years before dying out at the same time as the dinosaurs. Despite their dominance of the prehistoric oceans, there are still many unanswered questions about their biology, anatomy and evolution. Plesiosaurs are really unusual animals, says Dr Ketchum, who looks after geological specimens at the museum. "They're a type of reptile related to other reptiles like dinosaurs, crocodiles, ichthyosaurs and turtles for example, but actually we're not really sure where they fit in the grand scheme of things." The animal was spotted by a group of amateur archaeologists from a shard of bone at a quarry. "One day, one of the members found a little bone over there from the flipper just lying on the clay," explains Dr Ketchum, gesturing at the 165-million-year-old skeleton beside her on the floor. "On further investigation, they found more and more bone and eventually they discovered the entire skeleton, which is very exciting. "We think it's possibly a new species but even if it's not, it's very unusual. They're very rare fossils - plesiosaurs, especially nearly complete ones like this." The fossil was discovered at the Must Farm quarry near Peterborough. Mark Wildman and members of the Oxford Working Group - a team of amateur and professional archaeologists who search for fossils - nicknamed her Eve, as she was their first major find. The true gender of the fossil is unclear, as the only confirmed female plesiosaur is a fossil found with a baby inside. The quarry hit the headlines earlier this year, when a Bronze Age settlement was unearthed. Eve was discovered in 2014 in a much older layer of the Earth - a swathe of rock from Jurassic times which was once beneath the ocean and is known for containing fossils of marine animals such as plesiosaurs and ichthyosaurs. The Oxford Clay, as it is called, stretches across much of England, and is exposed in quarries around Oxford, Peterborough and Weymouth, where many of the fossil discoveries of Victorian times were made. 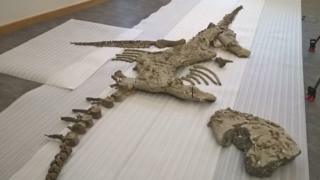 The fossil was donated by quarry owners Fonterra to the Oxford University Museum of Natural History, where staff have spent months cleaning and repairing it. In a laboratory at the side of the museum, conservator Juliet Hay is delicately paring away mud from the reptile's skull with a scalpel. The skull is still encased in clay that is being removed a flake at a time in order to preserve the delicate bones and teeth. It is a painstaking task, requiring nerves of steel, but essential to get the skull of the specimen ready for further analysis. A few weeks later, in the basement of the Life Sciences Building at Bristol University, I meet Dr Roger Benson, who is investigating the fossil. As the skull goes round in the CT scanner, he tells me about the find. "I think we're going to see some really beautiful bones," he says. The skull has already been scanned once at the Royal Veterinary College in London to examine the positioning of the bones and teeth inside the block of clay. This more powerful CT scanning machine at the University of Bristol could unlock the secrets of Eve the plesiosaur and determine whether she is a new species. "It's really clear in these high-resolution scans that we've got lots of really well-preserved bones that are going to give us lots of information," says Dr Benson. "From what we've seen already from the body, we know it has some features that are different to the other animals that we've seen before so it's very likely that this is an animal that is new to science." He says further examination of the new details of the skull will help to confirm this. It will also help Juliet Hay to extract the bones with more precision. "This is a bit like doing a jigsaw puzzle when you do have the lid and its picture," he adds.